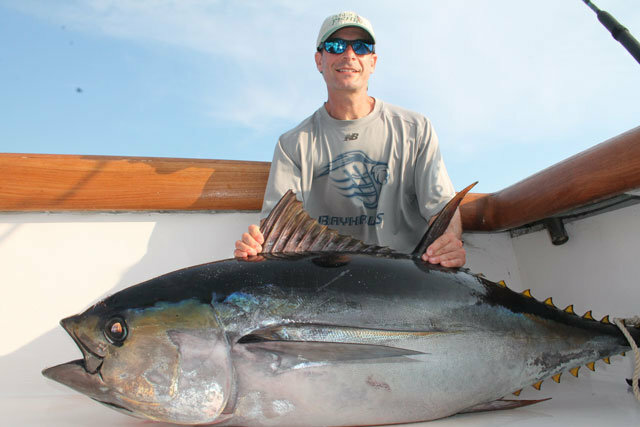 This bigeye tuna was quite a catch - and this is quite a photo, to match. Okay, this was a BIG fish. In fact, it’s a 157-pound bigeye tuna, which my brother Bill (you see him here) cranked in during an offshore trip last week. But it looks one heck of a lot bigger in this photo than it does in any of the other we took that day. And believe me, we took plenty of picture of this critter. This bigeye tuna was quite a catch – and this is quite a photo, to match. Do you sometimes snap off a pic or two, and wonder how a fish that seemed so large in person ended up looking so puny? Here are five tips that will help you make your fish look bigger, in the pictures. 1. Shrink the person, so the fish appears larger in contrast. Note in the picture above that Bill is kneeling down next to the fish. We have the same shot with him standing upright, and the fish isn’t nearly as impressive. Remember that people are always looking for a frame of reference when it comes to size in a photo, and if you can shrink that frame of reference, you enlarge the subject (the fish). 2. Always place the fish in the foreground, and the person in the background. Again, this is a technique for shrinking the person, thus making the fish look bigger in comparison. With smaller fish, you can usually accomplish this by having the person hold the fish with his or her arms out-stretched, so the fish is significantly closer to the camera. 3. Present the fish’s largest or widest profile. If you have any pictures where the angler holds the fish’s back towards the camera, you know what I mean−it makes the fish look skinny, even if it’s a real lunker. 4. Extend any and all fins. Note that Bill is keeping the bigeye upright by holding it at each dorsal. This is no accident. If he supported it elsewhere the fins fell flat, and the tuna didn’t look nearly as impressive. 5. Fill the entire frame with the fish. In this case, I could have gotten a bit tighter on the fish’s head; that would have been even better. Also note that I cut off the fish’s tail, which is generally a no-no. In this case including the tail didn’t make the fish look any larger (yes, I have some shots like that, too), but it did make for a better shot, overall. Extra-added Bonus Tip: If you really want to make that fish look huge, get out there and fish more, more, more, until you catch a massive beast like this one! !